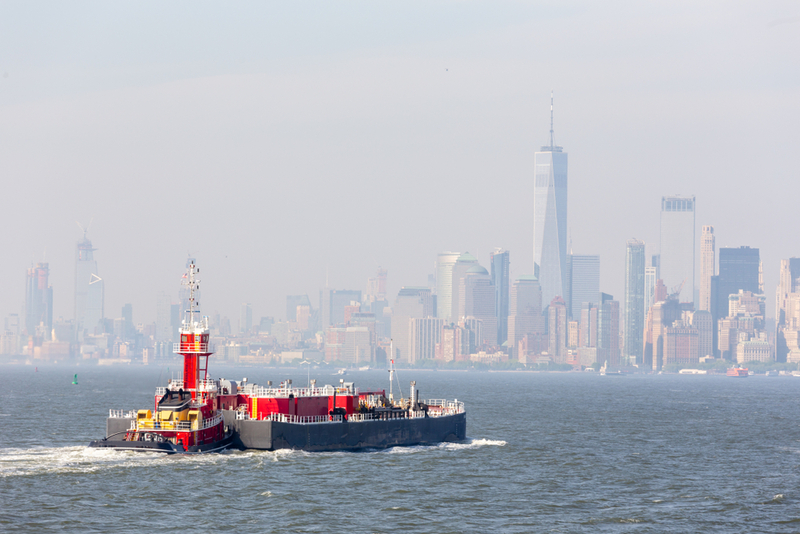 Several projects to shift truck traffic on to barges, and several other more general goals to meet the same target, are part of the Freight NYC project that is being implemented by New York City’s Economic Development Corporation. The development of a marine barge terminal at the South Bronx area known as Hunts Point is a key part of the plan, according to Ryan White, the EDC’s director of freight initiatives and ports. Hunts Point is a major food distribution center that several years ago expanded when the legendary Fulton Fish Market moved from downtown Manhattan to Hunts Point where there already was significant food distribution activities. Truck traffic was moved out of Manhattan’s tight streets and on to the Bronx’ tight streets. But White said the EDC sees barges as a solution. “Currently, there is no maritime activity in the Hunts Point peninsula, so this would be a first,” White told FreightWaves. “Given the fact that we own the land up there, we are going to be developing this site.” There would need to be short-haul trucking from any new maritime facility to the actual market. White said he hopes the Hunts Point project would “jump start” a harbor barge growth service that would start in the Bronx and expand to a more regional service throughout New York harbor. The EDC will determine the appropriate site location of a barge terminal in the coming months. Another proposal that has an RFP circulating would be to find a developer for land near the Sunset Park freight hub near the Brooklyn Army terminal on the East River. Part of that freight hub includes the 65th Street railyard, and White said he envisions a joint maritime/rail/truck facility that can take in barge traffic, take rail cars floated across the harbor from New Jersey and ship the freight out to parts of the city and Long Island either by truck or by the rail connection at the railyard. That cross-harbor service is the focus of an ongoing Port Authority of New York environmental impact statement. (The PANY is jointly operated by the states of New York and New Jersey and manage a wide variety of interstate activities, including the harbor and cross-Hudson facilities like the George Washington Bridge). The EIS study—which is actually the second--is looking to either expand the cross-harbor project, either by increasing the existing service, which puts rail cars on barges and ships them across New York harbor to Brooklyn, or to build an ambitious cross harbor freight tunnel, a project that has long been discussed. Those were the two options left standing after the first EIS. “We’ve seen in the last 20 to 30 years an increase in freight rail volumes in the city, thanks largely to the Port Authority’s investment in the cross-harbor car float,” White said. That marine service combined with the freight connection to the rest of the continental U.S. are the two rail connections Queens, Brooklyn and suburban Long Island have with the national rail grid, “and our investments are going to complement the growth,” White said. This map from FreightNYC shows the locations of projects where developers are sought at Sunset Park and Hunts Point, as well as possible points for transloading of additional rail traffic on to trucks. The EDC is working with the New York & Atlantic Railway—which operates a freight-only railroad on Long Island Rail Road tracks—to identify possible areas for trans loading, White said. The idea would be that what the city hopes would be more freight coming into the city by rail would have a greater number of transloading facilities where shipments can be taken off rail cars and moved on to trucks for the final delivery. The city’s other key rail connection is the revived Staten Island Railroad. It has a connection to the “mainland” across the Arthur Kill Vertical Lift Bridge, which crosses the Arthur Kill waterway over to New Jersey. It also is connected to the Global Container terminal. That terminal sits on city-owned land. “The reactivation has been a good thing for Staten Island in getting trucks off the road,” White said. Another RFP the EDC has put out involves setting up warehouse facilities near JFK Airport. White said there was no tie to maritime or rail operations there, but is driven by the fact that air cargo is expected to continue to increase and warehouse space in New York is increasingly tight. Many of the other stated goals of Freight NYC are less specific than steps such as the Hunts Point project: setting up a barge council for the region; work to expand barge service not just between New York and New Jersey but also up into New England; and maintain regular dredging of such local waterways as Flushing Bay or Newtown Creek.